Vice-president of her senior class and the National Honor Society. She also was involved in the student leadership team and student athletic advisory board. In the community, Hope was a volunteer working with Migrant Ministry, Kalamazoo Valley Children’s Museum and she worked as a volunteer for the United States Tennis Association Nationals at the Zoo. She participated in Caring Network and the American Cancer Discovery Shop. Ethan is the son of Barb and Keith Shuster. He graduated with a grade point average of 96.8% weighted on a scale of 100%. Ethan is attending University of Connecticut, studying pre-med, and plans to be an anesthesiologist. The athletic director at Shelton High School is John Niski. Ethan earned eight varsity letters participating in soccer and indoor and outdoor track and field, while serving as captain of his track teams. He was honored as a Wendy’s Heisman State Finalist. Ethan was a member of National Honor Society and volunteered in the Annual blood drive, while participating in Junior State of America that helped prepare him for government issues within his community and state. Ethan’s community activities included volunteering at Norwalk Hospital, where he served over 275 hours in the areas of operating room orderly, post anesthesia care unit, ambulatory care and transporting patients in and out of surgery and the pathology department. The Scholarship Competition: Students from 50 state athletic administrator associations, plus the District of Columbia, were able to submit a nomination form and essay. The male and female winners were then screened by one of the eight Sections in which their state resides, creating eight male and eight female Section winners. The NIAAA Board of Directors then evaluated the finalist’s scholastic record, athletic participation accomplishments, citizenship and leadership credentials on its way to selecting one male and one female national recipient. 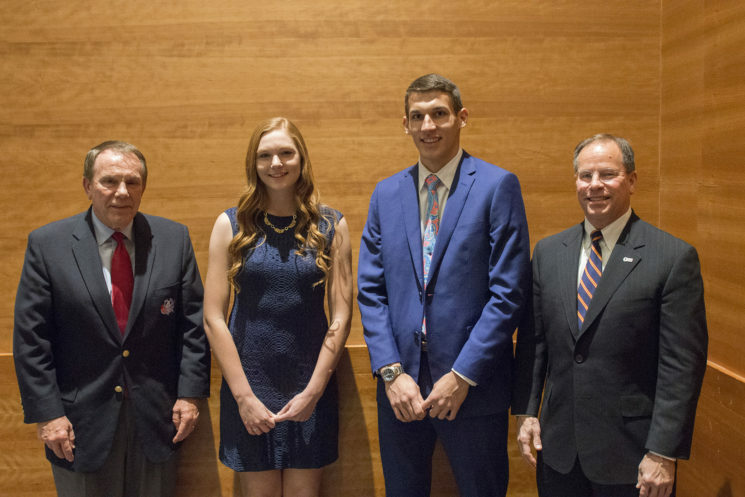 Both recipients were on hand in Phoenix to receive their national scholarship of $2500, a personal trophy, a plaque for their high school and to read their winner essay entitled How High School Athletics Have Impacted My Life. The total scholarship earned by the two national recipients was $4000.